Brush chicken and zucchini with olive oil; sprinkle with salt and pepper. Grill chicken over medium-high heat for 5 minutes. Turn chicken over; add zucchini to grill. Grill 5 minutes longer, or until chicken juices run clear and zucchini is tender. Slice chicken into strips; set aside. 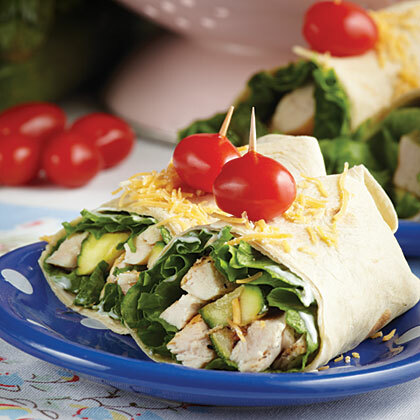 For each wrap, spread one tablespoon salad dressing on a tortilla. Top with a lettuce leaf, 1/2 cup chicken and 3 to 4 slices of zucchini. Sprinkle with cheese; roll up.